Previously included in the highly-anticipated debut season of the experimental Pocket Theater at the Seattle Creative Arts Center to solid houses and glittering reviews this past March, MythFest returned to the stage in September 2014 not only as part of the 2014 Seattle Fringe Festival roster, but was also invited to remount in the Pocket's newly-minted theatre space in the Greenwood neighborhood. 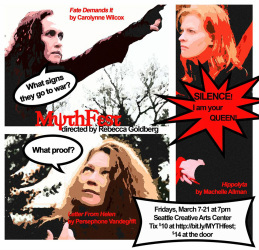 Directed by Rebecca Goldberg & comprised of three short, myth-based works by local playwrights Machelle Allman, Persephone Vandegrift and Carolynne Wilcox, this mini-festival packs a Trojan punch in the span of an hour, updating universal stories with contemporary language and points of view. Allman and Wilcox, along with Jen Smith Anderson will reprise their roles. New to the piece and performing original songs will be Abi Grace, featured as the enigmatic and not-entirely-benevolent oracle goddess. If you didn't get a chance to see us the first or second time around, we hope you can join us for the 3rd! And if you DID get to see us, come again and see what's new, how the piece has deepened and morphed in an ACTUAL THEATRE SPACE WITH REAL THEATRICAL SOUND AND LIGHTING! We are very excited about this, as you can see. 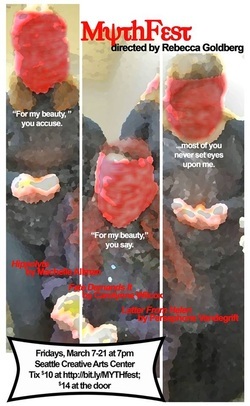 MythFest was recently performed during Seattle Fringe Fest 2014 at the Eclectic Theater on Capitol Hill at 1214 10th Ave, and we reprise, for ONE MORE performance at the Pocket Theater on Sunday, September 28th at 7pm in Greenwood at 8312 Greenwood Ave N - click here for a virual tour provided by Pocket artistic director, Clayton Weller himself!